Next time you’re out for a stroll on a sunny afternoon, bend down and touch the sidewalk. All the warmth you feel is solar energy, frittered away into useless heat. Now picture the vast expanses of roads and parking lots all over the world, baking in the sun. What if that sunlight could be harnessed for electricity? What if, instead of cement and asphalt, roads were paved with solar cells? In a stretch of bike path in the Netherlands, a design consortium has turned that techno-futuristic vision into a promising, albeit small, reality. The 230-foot-long, $3.7 million bike path in the town of Krommenie opened to the public last week, and its creators, the research group TNO, say it is the world’s first public road to include embedded solar cells. The “SolaRoad” project was built in prefabricated slabs of concrete approximately eight by 11 feet, topped with crystalline silicon solar cells coated in a thin layer of translucent tempered glass. Allowing as much sunlight as possible to hit the solar cells was a particular design challenge on a surface that must also be safe and practical for cyclists, the creators said. 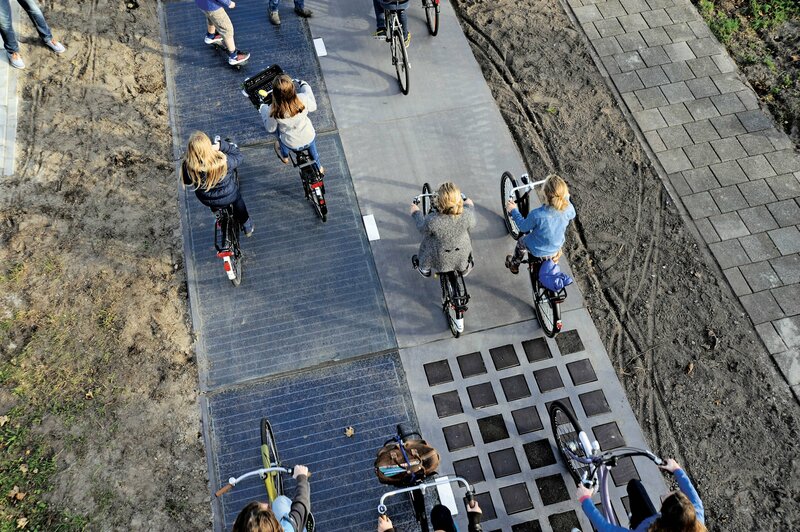 While the path is expected to generate electricity to meet the needs of only three houses, TNO and the government of the province of North Holland (which funded the project), say it is pilot project for a much larger vision of paving roads with similar solar-cell slabs. The cells must lie flat on the road instead of being angled like rooftop solar panels, so each unit of bike path will produce about 30 percent less power than their typical rooftop counterparts. But, the designers note, the Netherlands’ total road surface spans around 87,000 miles of potential solar-cell hosting asphalt. That’s “significantly larger” than the area of suitable rooftops, according to the creators. In the U.S., husband-and-wife duo Scott and Julie Brusaw have dedicated their lives to a similar vision. Their Idaho-based Solar Roadways project has received multiple research grants from the Federal Highway Administration (FHWA) to build a solar parking lot, completed in March, and raised $2.2 million on Indiegogo earlier this year to continue development. The FHWA is currently reviewing test results from the Brusaws’ solar parking lot. The agency considers the technology to be interesting, though very preliminary, and cautions the public against imbuing the idea with too much utopianism. But Scott Brusaw, the veteran electrical engineer behind the design, has big hopes. In a video about Solar Roadways that went viral earlier this year, with 18 million views and counting, Brusaw’s interlocking hexagonal panel design is shown in mock-ups with built-in LEDs programmed to display lane lines and crosswalks, as well as heating elements that would, according to the video, keep roads a few degrees above freezing, thus eliminating the danger of winter ice. Underground channels running alongside the solar roads would house electrical cables, eliminating the need for telephone poles. According to Brusaw’s calculations, which he breaks down on the project’s website, if all roads, parking lots, driveways, playgrounds, bike paths, and sidewalks in the continental U.S. were replaced with Solar Roadways’ panels, they would produce over three times the electricity currently used in the country. While Brusaw’s vision may be of a far-off future, the era of attainable solar power is already here. A Deutsche Bank report in October concluded that by 2016, solar power will cost the same or less than electricity from the conventional power grid in almost every U.S. state. The cost of solar panels have fallen precipitously in recent years. In 1972, the price of an average watt of solar power stood at $75. In 2012, that dropped to less than $1 per watt. By 2015, solar modules from China are expected to run the consumer just 42 cents per watt. November 11, 2014: This article orginally incorrectly stated that solar modules from China were expected to cost 2 cents per watt by 2015. They are expected to cost 42 cents per watt.